Winter variety with skiing, hot springs, Almaty city, snow mobile excursion and Charyn Canyon. 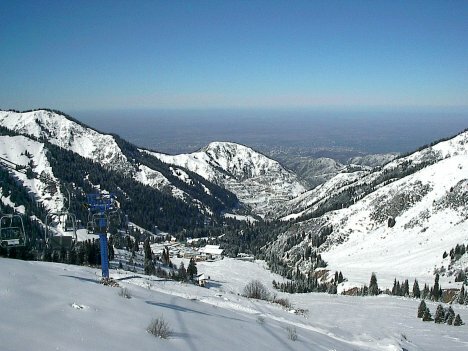 Almaty and surroundings has fantastic possibilities for a varied wintersports holidays. In fact Almaty narrowly lost out to Beijing as an organizer for the 2022 Winter Olympics unfortunately. This wintersports program is new and diverse. Except for alpine skiing in the Chymbulaq skiing resort nearby the city (for three days) you will discover Almaty and enjoy a two-day tour into Almaty Province with accommodation in a hot spring resort in the steppe. In addition during this two-day tour you will visit spectaculay Charyn Canyon and take part in a snowmobile tour of an hour at Lake Issyk. Plenty of variety in the Kazakh winter! You can expect temperatures till minus 10-15 Celcius at night and in the high mountains. The sun is shining a lot in winter in this region. Flight from home to Almaty. Arrival in Almaty, usually at night or in the early morning, and transfer to hotel Chymbulaq, situated at 2,200 meters and a 1.5 hours drive from Almaty Airport. Checking in and leisure time for skiing all day. Skiing equipment can be rented in the resort. Full day at Chymbulaq, accommodation in hotel Chymbulaq. Another day at the skiing resort. Alternatively you may opt to use the Gondola to ice-skating complex Medeo, down at 1,600 meters. Or even decide to be taken to the city earlier. Transfer to Almaty city (approx. one hour) and accommodation in 4* hotel Kazzhol. A completely different program starts today. By car you will be transfered to the hot springs of Zhundzha at some 220 kms from Almaty. In a small resort with outside pools, accommodation, restaurant and some relaxation options you can relax for the rest of the day. Meals are included today. After leaving the hot springs the first stop is spectacular Charyn Canyon, where you will have time for a hike in the canyon. Moving further, on the way back to Almaty, at Lake Issyk you will be offered a one-hour ride in a snowmobile across the snow in the mountains nearby the lake! The day ends in Almaty at hotel Kazzhol and accommodation. Lunch is included today. On the last day in Almaty you will enjoy a guided city excursion, showing you Panfilov park with the Zenkov cathedral, Kok-Tuebe Hill in the city and other places. Transfer at night to the airport, end of your holidays. The cost of this program at four persons is €620 p.p. and at two persons €820 p.p. For other group sizes please write us for an offer. 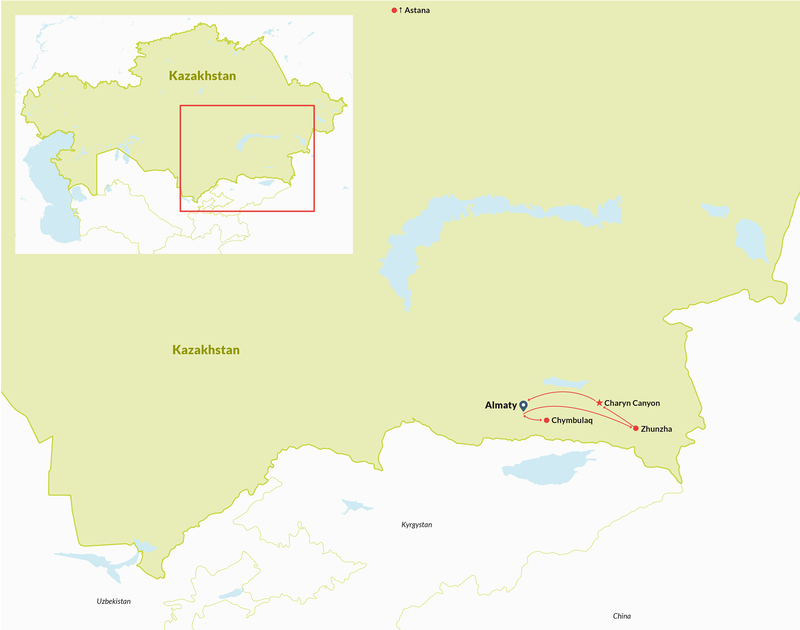 – three nights of accommodation in 4* hotel Kazzhol in Almaty, two nights in hotel Chymbulaq and one night at a hot spring resort, on the basis of bed & breakfast and double rooms. Not included in the offer are the international flight tickets, the remaining lunches and dinners, early check-in on day 2 if needed, rent of all skiing equipment and lift passes, and all services not mentioned.